In developed countries, women can take for granted that clean water flows freely from the tap, toilets empty with a simple flush, and established infrastructure handles sanitation. But in other parts of the world, women don’t have that luxury. Two-thirds of Earth is covered with water, yet billions of people do not have access to clean water in developing countries. And according to Water Governance for Poverty Reduction (PDF), a report from the United Nations Development Programme, these water and sanitation problems disproportionately affect women and children (p. 35). Due to traditional gender roles, the report states, women (and, as a result, their children) bear the responsibility of securing water for households, which often means standing in long lines or walking many miles to and from the water source. These women also must dispose of dirty water and human waste and rarely have access to safe or private sanitation facilities. In 2002, the United Nations recognized clean water for personal and domestic uses as a fundamental human right. It set an international goal of providing access to safe water, sanitation, and hygiene (WASH) to all people by 2030. With little more than a decade left, organizations around the world are working fervently to make that directive a reality. 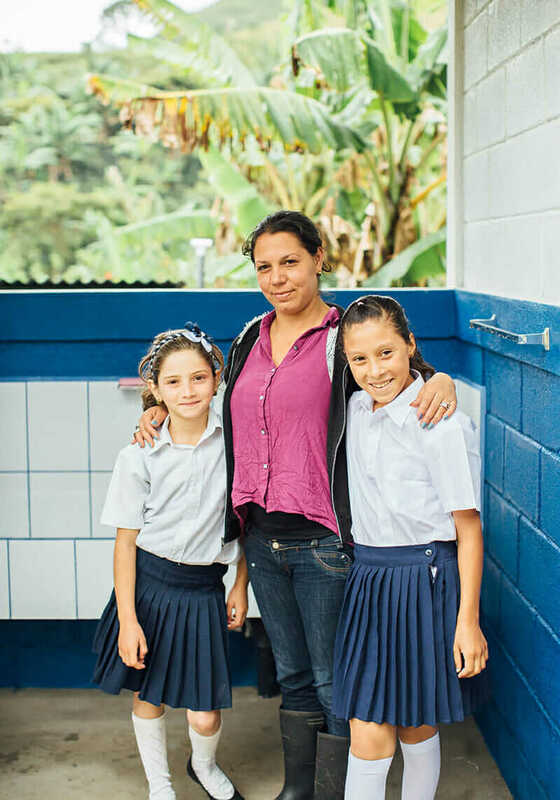 Happy faces following installation of a hand-washing station at a school in Nicaragua. Courtesy Water For People. Take, for example, Water For People, an international nonprofit founded in 1991. Today, Water For People operates in rural and peri-urban areas of nine countries, helping provide access to water, sanitation, and hygiene. In a recent TEDx talk, Water For People CEO Eleanor Allen underscored that water is indeed a women’s issue, due to time spent gathering water, educational opportunities lost or abandoned, and toilets—or lack thereof. For Allen and Water For People, solving the global water crisis starts at the local level. The organization partners with municipalities and communities, providing development assistance and infrastructure-building support to help cultivate sustainable, self-sufficient, and safe water utilities and sanitation services. Leave your water project in good hands. Reaching the UN’s 2030 goal will require investing $50 billion per year to build the missing sanitation infrastructure worldwide. But once those toilets and taps are installed, Allen says, it will mean triumph for women. The prototype house, in TAMassociati’s eco-village, takes shape in Keur Bakar, Senegal. Courtesy TAMassociati. It’s this same dedication to improving the lives of women worldwide that led Italian architectural design firm TAMassociati to develop an eco-village in Senegal. “The goal is to design a prototype house that can harvest and store water supplies for all domestic uses—drinking, cooking, washing, irrigation—and to integrate the scarce water resources in a few artificial walls,” says TAMassociati Partner and Senior Architect Massimo Lepore. “Scarce” is an understatement in these regions. According to Lepore, Western water consumption averages around 300 liters per person per day—a stark contrast to African countries, which suffer from chronic lack of water. In Senegal, average water consumption is just 20 liters per person per day. In Madagascar, it’s only 10. The eco-village’s design implements devices that can control waste, purify water in storage tanks, and clean dirty water for small agricultural uses (think watering small vegetable gardens or feeding animals). Lepore and his TAMassociati partner Raul Pantaleo hope that, soon, entire villages of these resource-dependent, sustainable homes will crop up, adding to clean-water efforts that are already improving the lives of women in Senegal. “Carrying out the project already produced impactful results,” Pantaleo says, including a new cooperative of building workers in the village. 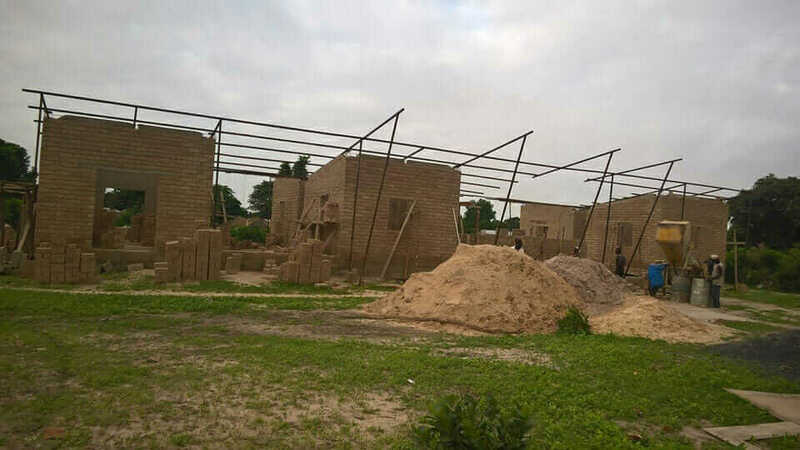 The workers produced all of the bricks for the community house and are now selling materials to neighboring villages. “At the same time, the local women’s association is organizing itself to improve agricultural capacity and know-how, and a local business connected to naturalistic tourism is going to be implemented in the village soon,” he says. 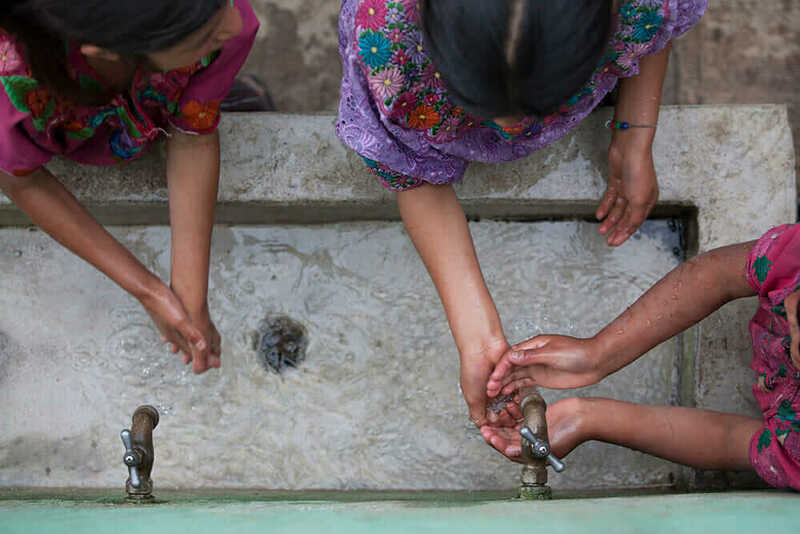 As Water For People’s Allen noted, the other side of this global water crisis—which impacts women just as severely as a lack of fresh water—is a lack of proper sanitation services. Today, many areas of the world don’t have adequate toilets, sewers, or any sanitation services at all. 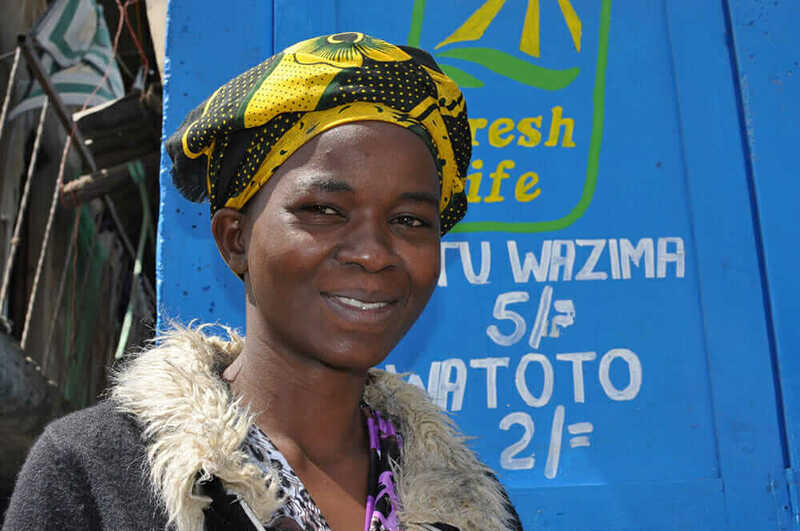 A Fresh Life Operator in Nairobi, Kenya. Courtesy Sanergy. “Around the world, 2.5 billion people lack access to improved sanitation—that is, a sanitation solution that separates users from their waste,” says David Auerbach, cofounder of Sanergy, a social enterprise dedicated to building and scaling safe sanitation value chains in Nairobi, Kenya. In Nairobi’s slums, inadequate sanitation is particularly menacing for women, impacting health, safety, economic prosperity, and more. Sanergy provides opportunities for people to invest in sanitation solutions for their friends and neighbors. Community members can purchase Fresh Life toilets—prefabricated, low-cost, high-quality sanitation stalls—throughout the city’s informal settlements and become Fresh Life Operators, entrepreneurs of sorts. Sanergy provides training, marketing support, access to interest-free loans, and ongoing operational support—including regular waste-collection services. In return, Operators can earn an income by offering a needed service to their communities. 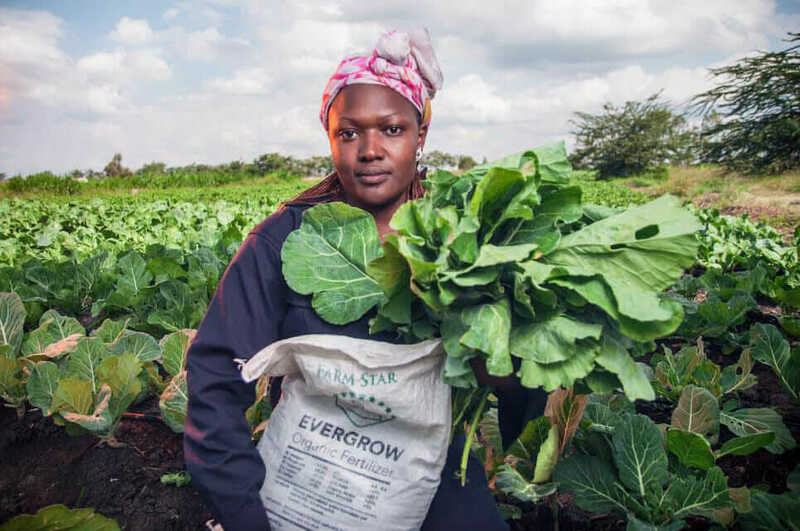 A Kenyan farmer uses Evergrow Organic Fertilizer, an end product of Fresh Life waste collection. Courtesy Sanergy. Sanergy’s waste-collection team then safely removes the waste from the community, properly treats it, and converts it to high-value agricultural inputs that are then sold to Kenya’s farmers. By providing a market for waste-derived end products, Sanergy shows that there’s value in human waste and incentivizes people to participate at every step in the sanitation value chain. Thanks to the work of these organizations and others around the world, the UN 2030 WASH goal is that much closer to being met. And as world leaders meet for World Water Week 2016, still more ideas, initiatives, and design solutions are sure to emerge—as will continued improvements for women worldwide. Water For People, TAMassociati, and Sanergy are all Autodesk Foundation grantees, chosen for their innovative use of design and engineering to solve the world’s most pressing challenges.